Torchon 48 x 80 cm - Coton 100% Naturel - Petite patte d'attache - Emballé dans une pochette en mousseline de coton. Imprimé fleurs. 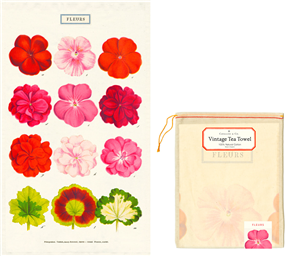 FLowers tea towel made of 100% natural cotton - 48 x 80 cm - Hang tab - Packaged in a muslin drawstring bag.